This morning, we got up early (Pacific Time, at least, but not necessarily Central Time). Malcolm was going to head to the office to settle up our bill and find out if we have to move to our reserved spot (since we arrived a day early). Since the office didn’t open until 9:00, Malcolm cleaned the bugs off the front cap of the trailer and did a couple other little tasks outside. At a little after 9, Malcolm headed down to the office and found that we did need to move to our assigned spot. The lady that was trying to figure all that out on the computer was part-time and had recently started, so she was having trouble figuring it all out. Another gentleman was there waiting and, once it was determined he was just trying to leave, Malcolm suggested the lady help him first. Shortly thereafter, the campground owner arrived to save the day with the computer. It turns out the gentleman trying to check out was actually vacating the spot that we needed to move to, so it all worked out well. The other gentleman got his receipt and left and the owner set Malcolm up and ran his credit card to settle up the bill. Malcolm walked back to the trailer and we all started buttoning it up to hitch up for our 100 foot move down the hill. We got the trailer moved and hooked up. Once that was done, we grabbed some items to take with us and headed out to Fox Island to visit with our daughter and family. Our son-in-law’s grandparents have a house on the Puget Sound out on Fox Island and the family tends to congregate there each weekend in the summer. We hung out, fixed sandwiches and chips for lunch and generally relaxed. When the granddaughters were about to wake up from their naps around 3:30 or so, we headed back to the trailer and tidied up. Our daughter and family came over to check out Nana and Pa’s trailer. We gave the grand tour and handed over a few items we had brought out for our daughter. After the tour and a few minutes of relaxing, we headed down the road to a pizzeria and had dinner. It was really good pizza. There were few leftovers to bring home. 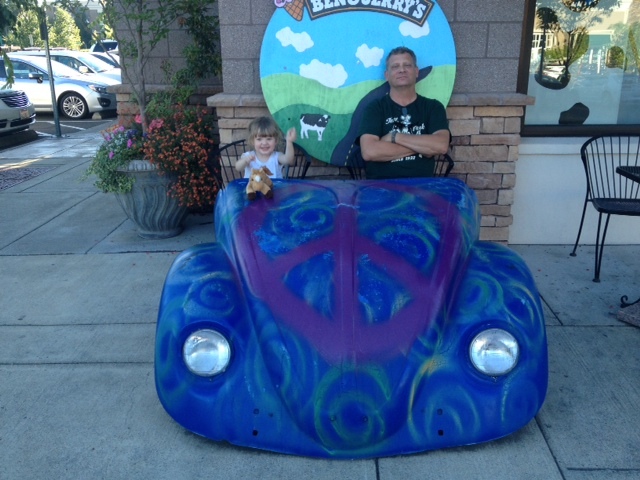 After dinner, Malcolm and David headed into Ben & Jerry’s to grab an ice cream cone. We headed back to the trailer and our daughter and family headed back to their trailer on Fox Island. Once we were back to the trailer, Malcolm did some more tidying up outside, including taking down the bikes and cleaning the back of the trailer. After that, we sat around and relaxed, watching some TV and playing on the computers. Violet driving Pa in the VW Beetle. This entry was posted in traveling, Washington. Bookmark the permalink. Enjoy your stay. It brings back memories as Elaine and I raised our family in Steilacoom, which is west of Lakewood and north of Ft Lewis.